Programs scheduled for this weekend on the Trails of History include Landis Valley’s Civil War Days, July 28-29; The Last Cruise car event and Hands-on History at Pennsylvania Military Museum, July 28 (see more info below on that); Blacksmithing demos at Drake Well Museum, July 28; and Animals at Pennsbury Manor, July 29. Eckley Miners’ Village has posted a bunch of great photos from their annual Patch Town Days program here. Eckley's next living history event is scheduled for August 18-19. Some recent Pennsylvania Military Museum programs were covered in the Centre County Gazette. A July 4th hands-on program is featured here and was so successful that it will be repeated tomorrow in conjunction with the Last Cruise car show on the grounds. A new program on the history of the 28th Division Shrine is outlined here; it will be offered Sunday evenings through August 19. 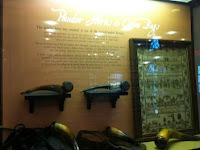 Visit the museum’s website for details. Congratulations to Cornwall Iron Furnace, which was named second most favorite Historic Attraction in the 2012 Best of the Lebanon Valley awards run by the Lebanon Daily News. (They were rated most favorite Lebanon Valley Historic Attraction among Republican Presidential candidates, after Gov. 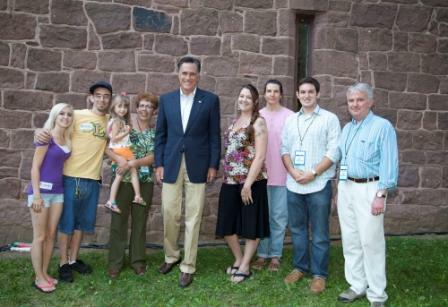 Mitt Romney’s rally there on June 16.) A new fundraising event, the “Cornwall Blast,” (as in blast furnace, but you knew that) is scheduled for Friday evening, August 3, featuring tastings of local wine and beer, plus music by the Wayne Fox Trio. Cost is $25 for adults 21 and over, $10 for ages 11-20 (there will be root beer and other refreshments), and free for ages 10 and younger. Tickets are available by visiting the site in person or by calling 717/272-9711 to purchase with a credit card. Numbers are limited, so reserve your spot now. PHMC, in its role as the State Historic Preservation Office, has released “Building Better Communities: The Preservation of Place in Pennsylvania.” This is the official statewide historic preservation plan for 2012-2017; it defines the role that historic preservation plays in revitalizing Pennsylvania communities. More information about the planning process and key elements of the plan can be found here. You can download a copy of the full document here. On Monday, Governor Tom Corbett and First Lady Susan Corbett began a three-day kayaking trip through western Pennsylvania to highlight the region's natural and cultural heritage and resources. As part of the trip, they rode the Oil Creek and Titusville Railroad and toured the Drake Well Museum to see the replica oil derrick and new exhibit-in-progress (you can see photos of the exhibit installation here.) Site administrator Barbara Zolli, PHMC Executive Director James Vaughan, and numerous staff and volunteers were on hand to greet the Corbetts and provide tours and historical background. The PA Internet News Service provided video of the activities. Congratulations to Walter Rybka, senior captain of the US Brig Niagara and director of the Erie Maritime Museum, on receiving the National Maritime Historical Society’s Rodney Houghton Award for Best Feature Article in Sea History magazine. Capt. 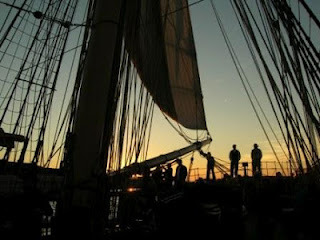 Rybka’s article, “The War of 1812 on the Inland Seas,” appeared in the Spring 2012 issue of the magazine, which is dedicated to “The Art, Literature, Adventure, Lore & Learning of the Sea.” Thanks to editor Deirdre E. O’Regan and PHMC web administrator Heather Myers, if you click here, you can read the article as it appeared in the magazine. Rybka has also written a book, The Lake Erie Campaign of 1813: I Shall Fight Them This Day, published by the History Press (and available in the museum store at the Erie Maritime Museum). On a related note, ERIEBANK is hosting a photo contest for its 2013 wall calendar, which will focus on Niagara. Go here for details on how to enter. This Sunday afternoon (July 22) at 3 p.m., the Friends of Joseph Priestley House will host Steve Warfel, senior curator of archaeology at the State Museum of Pennsylvania from 1980 to 2007, for a talk about archaeological findings at Priestley House. Warfel has directed excavations at a number of PHMC sites in addition to Priestley, including Ephrata Cloister and Eckley Miners’ Village. The program is free, although if you would like to take one of the regularly scheduled tours at 1 or 2 p.m. (the 3 p.m. tour is cancelled on the 22nd), the site admission fee is $6 for ages 12 to 64, $5.50 for those 65 and older or with AAA discount, $4 for youth age 3 to 11. 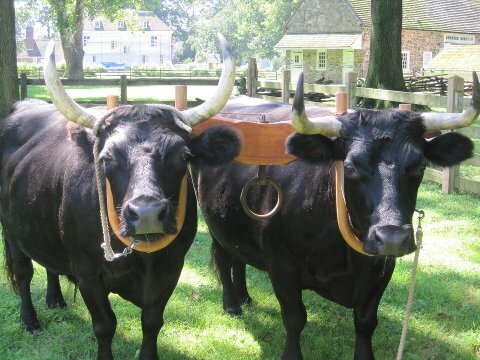 Other activities going on this weekend include: Lock, Stock, and Barrel, July 21-22 at Landis Valley Village and Farm Museum; Celtic Heritage Festival, July 21 at Graeme Park; Garden Highlights, July 22 at Pennsbury Manor; Vietnam Revisited, July 21-22 at Pennsylvania Military Museum; and Living History Day, July 21 at Old Economy Village. More to report next week, but I’ll leave you with this video showing great times at Pennsylvania Lumber Museum’s 2012 Bark Peelers’ Convention. But first, here’s a little video of a fashion designer’s photo shoot that included venues in Philadelphia and, more importantly, on the PA Trails of History. Ephrata Cloister appears not quite midway through, followed by Landis Valley. I kept expecting the faux-Amish people, who look pretty sinister, to start chanting menacingly (those models won’t be able to run very well in their stiletto heels if the pitchforks come out). But I think our sites look beautiful (and some of the clothes aren’t bad either). Last month we brought you a sneak peek at a new exhibit installation at Old Economy Village. Well, the exhibit opened this week and it will be up at least through next June. “Faces and Places” makes full use of the museum’s extensive photographic archives, showing images from the 1870s to the 1910s. There are also photos from the 1960s restoration of the site and a model that helps put the photos into 3 dimensions. Curator Sarah Buffington told me that they’ve also put some of the photos on Historypin.com, so I ventured onto the information superhighway to check it out. You can too (click here). If you visit Old Economy (in person) and have a smartphone with the Historypin app downloaded, you can find a historical image and add your own photo of what the same scene looks like now. I can’t wait to try it myself sometime in the coming year. I’d love to see comments to this post from people who’ve used Historypin. I’m in the metaphorical slow lane, but I’m getting there. Way back in April (yikes! ), I had the chance to visit the new exhibit at Landis Valley Village and Farm Museum (and before you ask, no, I was not one of the models in the photo shoot, but I can understand your confusion). “The Golden Age of an American Art Form: the Lancaster Long Rifle” draws on the museum’s collection as well as those of other institutions and private individuals. 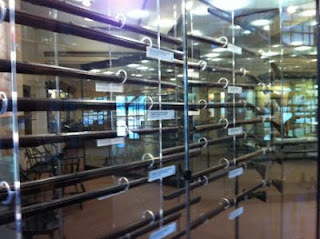 Exhibit cases and panels on the surrounding walls provide historical context and documentation, as well as showcasing gun makers’ tools and related equipage. I’ve never been all that interested in firearms in and of themselves, so the historical context and supporting information really helped me to understand and appreciate the stars of the show. A copy of the exhibit catalogue, with gorgeous color photos keyed to the firearms cases is available in the exhibit for those who want more details (you can purchase your very own copy at the Weathervane Museum Store). One of the exhibit panels directs visitors to the recreated gun shop on the grounds, helping very nicely to tie this temporary exhibit (which runs through December) to the more permanent displays. 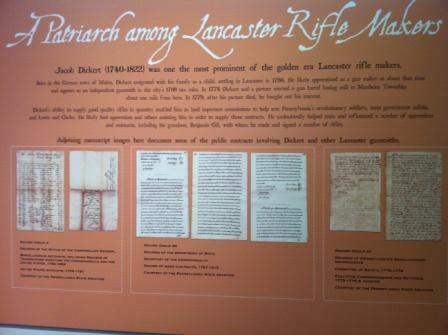 On July 21 and 22, Landis Valley will offer “Lancaster Long Rifle: Lock, Stock, and Barrel,” featuring the guest curators and other knowledgeable folks to talk about the exhibit and the history of the long rifle (more info here). The Pennsylvania Historical Marker Program captures the memory of people, places, and events that have affected the lives of Pennsylvanians over the centuries since William Penn founded his Commonwealth. You have probably seen many of the blue and gold markers throughout Pennsylvania. Since 1946, Pennsylvanians have gathered to unveil, dedicate, and celebrate the installation of new historical markers. Virtually all of these ceremonies are public events, and you're invited to attend those held near where you live or whose subject matter interests you. It was the site of the final circus show under the Big Top for Ringling Brothers and Barnum & Bailey Circus. 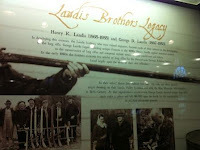 The event garnered local and national media attention. An early NASCAR Raceway, although rather short-lived, it hosted some significant races. In 1852, surplus milk and cream from the successful dairy industry in York County, PA was used to produce ice cream that was distributed commercially for the first time in the US. Although the primary market was Baltimore, Jacob Fussell chose to set up his factory in Seven Valleys, PA, closer to the supply of raw materials. Although Fussell’s operation was moved closer to the market in 1854, York County farmers continued to manufacture and distribute ice cream to the Baltimore market through the 1940s. A leader in Pennsylvania's environmental history. As Executive Director of the Fish & Boat Commission, his primary accomplishments were the protection of water quality against pollution, and the restoration of American shad to their native Susquehanna River. Due to the British occupation of Philadelphia during the American Revolution, the Provincial government’s gun manufacturing facility was moved to the interior of the state so that operations to supply the Continental army with muskets and rifles could continue. Hummelstown was chosen due to its remoteness, proximity to Lancaster’s armory, and availability of materials and water power. Visit the Pennsylvania Historical Marker Program website for more information about the program or to search the marker database. If you are on the go, you can use your smartphone to view the Pennsylvania Historical Markers mobile website and locate the markers nearest to your location. A small selection of marker photos are pinned to our Pennsylvania Historical Markers board on Pinterest. Photos are pinned regularly, so be sure to follow the board for all of the latest updates. In April, the Railroad Museum of Pennsylvania opened a new temporary exhibit, “The Role of Railroads in Pennsylvania During the Civil War,” in its second floor gallery. The exhibit explores the impact of railroads on the war (and vice versa) using both statewide and national contexts. I had a chance to see the exhibit last month and will share a few of my photos (the ones that aren’t too blurry to use—not sure what happened). One of the running themes of the exhibit is the role of telegraphy and telegraph operators in communicating troop movements and supply needs. By 1861, railroads were using telegraphy to dispatch trains and had a network in place. Railroad telegraphers played an important role on both sides of the conflict. The exhibit runs through December, so there’s still time to catch it. On Saturday, July 14, the museum will present "Three Authors and an Artist," a Civil War-themed event featuring authors Herbert H. Harwood, Jr. (The Railroad that Never Was), Diana Harris (Reflections of a Civil War Locomotive Engineer), and Scott Mingus, Sr. (Flames Beyond Gettysburg). Artist Bradley Schmehl will sign reproductions of his painting, Columbia Bridge Burning. You can get more info (and order books) here. The Pennsylvania Civil War 150 Road Show is on the move again. It’s at the Kutztown Folk Fest in Berks County through this weekend (that is, now through Sunday, July 8). Next weekend (July 12-15) it will be at the Centre County Historical Society, not too far from either the People’s Choice Festival of Pennsylvania Arts and Craft (on the grounds of the Pennsylvania Military Museum in Boalsburg) or the Central Pennsylvania Festival of the Arts (in State College). For a complete schedule of the Road Show’s appearances this summer, including a visit to the State Museum of PA, July 20-22, go here. And for an update on the Civil War Muster Rolls project, check out the Pennsylvania State Archives summer newsletter here.